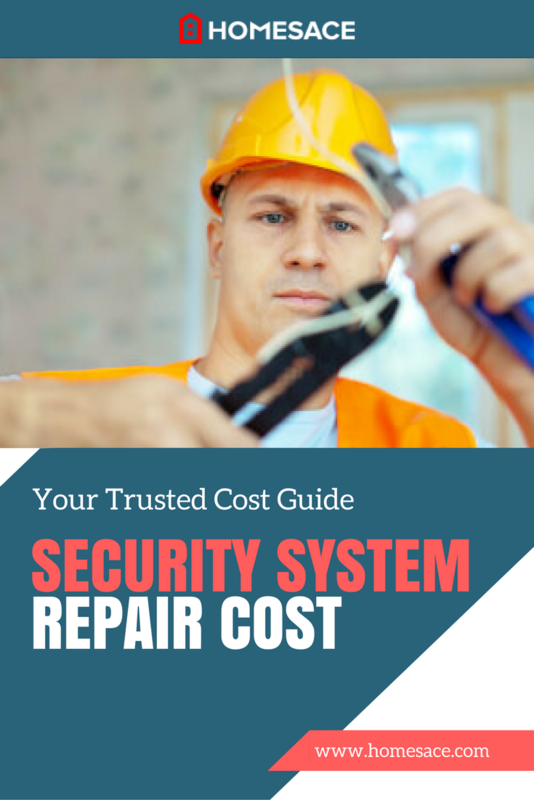 How Much Does Security System Repair Cost? Home security systems have become a necessity in the modern day world. With our schedules changing and taking us away from our homes hours on end, it is always reassuring to know that someone is looking over your house. Since hiring a security guard is excessively expensive, it is just but sensible to count on your alarm system to take care of your home. The efficiency of your home security system will depend on how often you do security system repair. How Much Will It Cost To Repair a Security System? The cost to repair a security system will depend on the type of system and the extent of the damage. A typical security system consists of sensors like window or door contacts, an actuator like a siren, and a controller. Any malfunction in any of these components or their communication channel would lead to partial or complete system failure. Simple problems like replacing a faulty sensor or short spans of wiring could cost as low as $100. However, most homeowners with average sized homes or security systems should expect to spend around $200 to fix any faults in their security system. Expect to spend up to $500 in case your security system repair needs to address more than one fault or replace one or more components. While troubleshooting your security system on your own might sound plausible, it is always a good idea to hire a professional to handle advanced issues. Your alarm manual will give you simple troubleshooting and fault management solutions. You should never go beyond these. Always leave the delicate security system repair to the professionals as they have the right skills and tools for the job. Visible malfunctions at the controller: The alarm controller could fail to arm or disarm the system. This could be because the controller is faulty. Faulty door and window alarm contacts meaning that the alarm doesn’t go off when you open the doors or doesn’t respond when you do a troubleshooting run. Annoying fault alarm beep from the security system controller. If you cannot interpret the warning, then call in a security system repair expert. The cost of hiring a professional to handle the security system repair will vary depending on the complexity of the repair and the person’s qualifications. Some monitored security systems will demand specific qualifications. Manufacturers could request that you use certified professionals to avoid voiding your warranty. Either way, the cost of hiring the accredited contractor will ensure that your system is working optimally whenever you need it. You might have to switch off the siren in your security system before testing the repairs to avoid creating unnecessary attention. If you are running a monitored system, chances are that your security company has certified technical support. This could be your cheapest way to efficient security system repair. Want to know your local security system repair rates? Simply enter your zip code into the space provided on this page for specifically tailored information regarding your area and the related cost to repair a security system. You'll get a no-obligation, 100% FREE estimate, which is a great way to decide what will be possible given your budget.